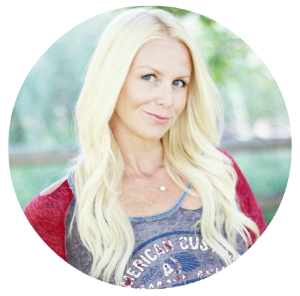 Hello fabulous friends! Gloria here from Simply Gloria and I’m so happy to be back! 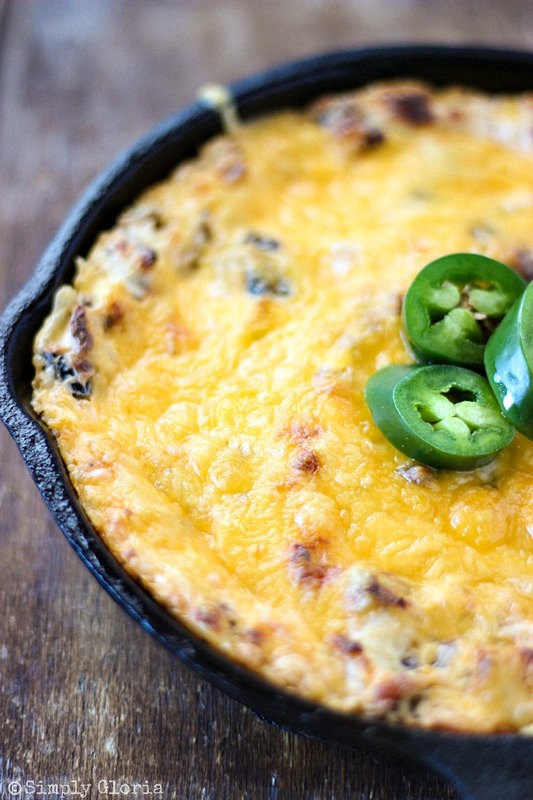 This time I’ve got a warm, cheesy dip to share with you. Ready to dive in?? Crispy bacon pieces and fresh jalapeños intertwining with melty cream cheese and topped with bubbly cheddar cheese. 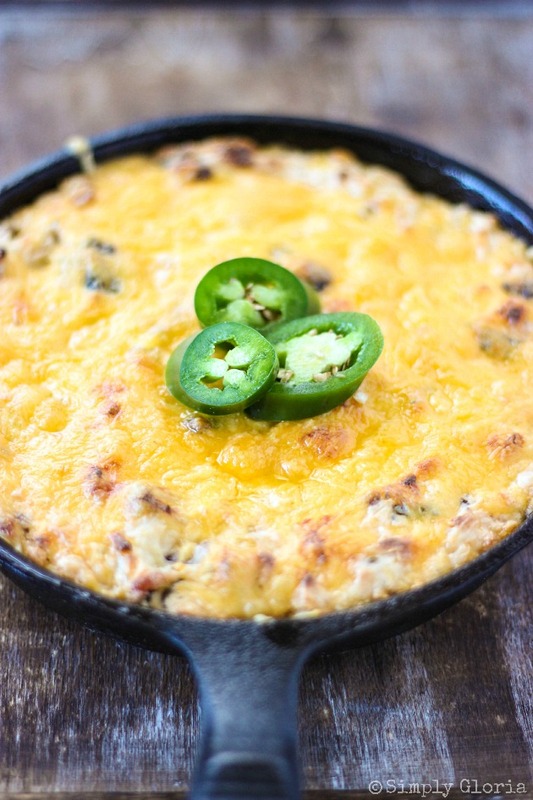 This Bacon Jalapeño Cheddar Cheese Dip comes together very easily and is SO delicious! I’ve never met a dip I didn’t like. 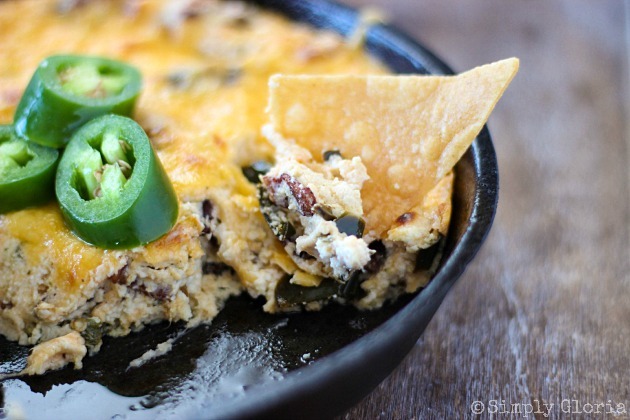 And with this dip… all the cheese, bacon, and my favorite part– jalapeños… is a dip that is a must-make and eat kind of dip! 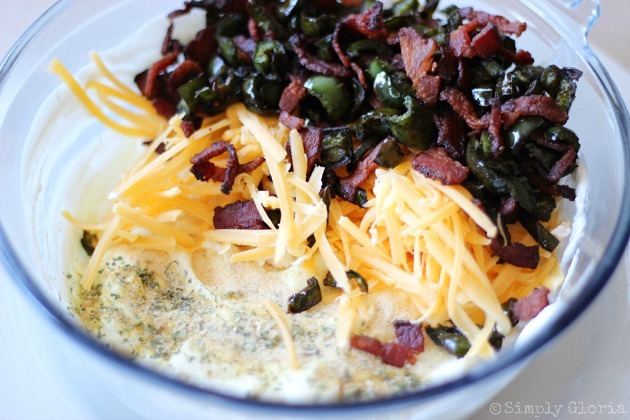 I’m going to share with you how to make this super easy warm and cheesy dip! After you’ve conquered the quick deseeding and deveining of the jalapeños (be sure to wear kitchen gloves! ), put them in a heated skillet and sauté with chopped bacon. 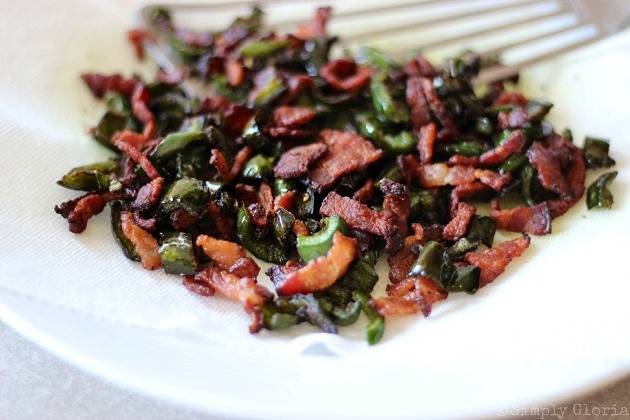 If you’re feeling more adventurous, use peppered bacon! And, if you’re wanting more heat left in the jalapeño, leave the veins and seeds in. Stir the deliciousness all together. If you can’t wait to make the cheese all melty and gooey, go ahead and start eating it now! Because it’s really divine as is. Cold or hot! You may go ahead and put the (amazing) mixture in a baking dish. I love to use my medium cast iron skillets at any given chance. You may even use a pie pan. Whatever you have, throw it in. 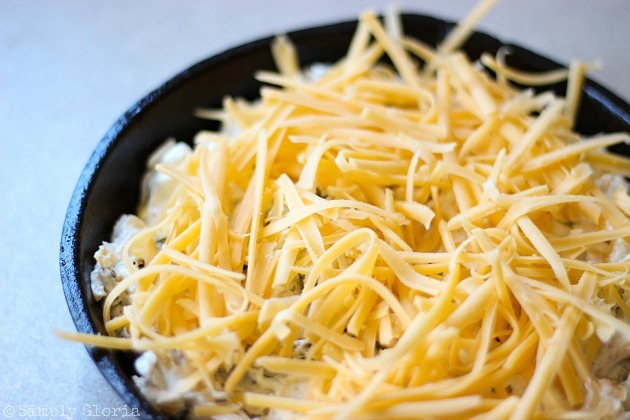 Top with more cheese. In my little cheese world, there’s no such thing as *too much* cheese. Bake until the cheesy melty action begins… then you’re all ready to devour! 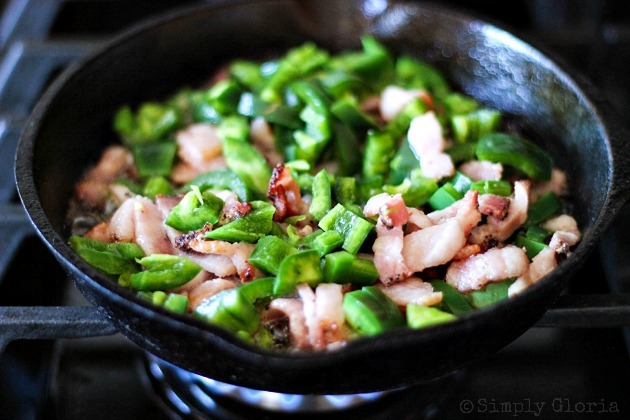 In a heated medium skillet, sauté chopped bacon and jalapeños until cooked. 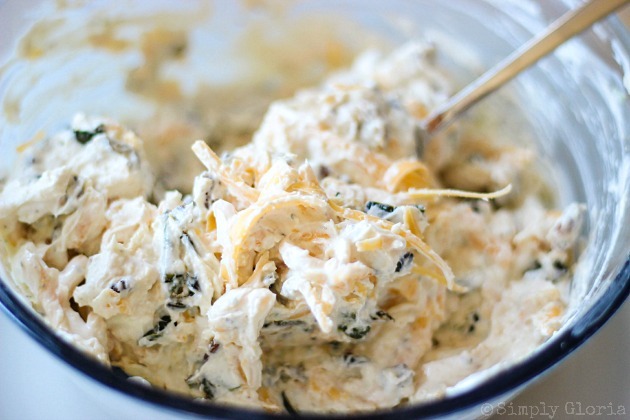 In a medium mixing bowl, combine cooked bacon, jalapeños, cream cheese, Greek yogurt, Parmesan, garlic and onion powder with 1 cup of cheddar. Spread mixture in a 9 inch baking dish (a pie pan also works well). Top with the rest of the grated cheddar. Bake in a 400 degrees preheated oven until cheese is melted, about 8-10 minutes. Serve with chips or artisan slices of bread. 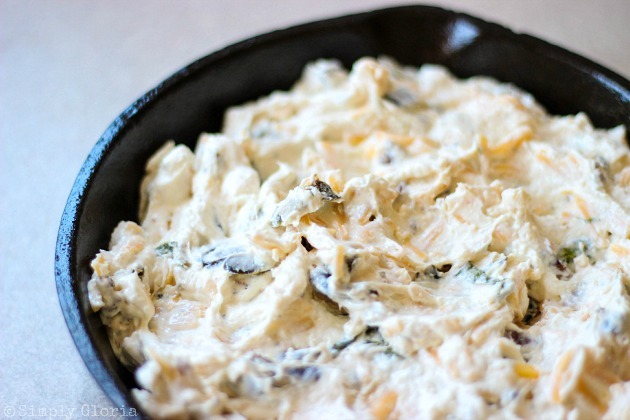 Makes about 2 cups of dip (may easily be doubled for a big crowd!). Enjoy, my fabulous ALC friends! Yummm! Cheese + bacon, what else is needed in life? Pinning this for later! Looks delish! Oh sweet maama jaama (sp?!) THIS LOOKS DELICIOUS! I am seriously drooling over here! SO going to make this! This looks AMAZING and I actually think I can do it at home!! (without it being a Pinterest Fail lol) Thanks! Oh, my goodness gracious. This looks so delicious! I wish it was in front of me right now! Get out! Can’t wait to try this! My husband would love this! 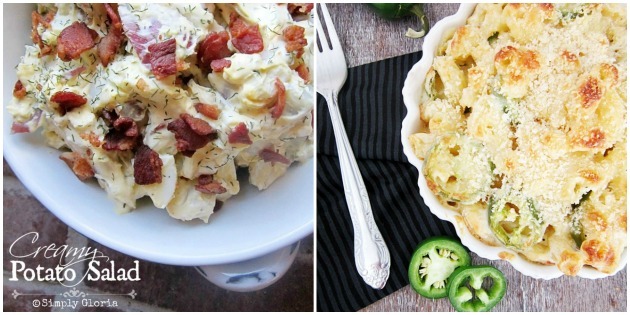 Cheese, bacon, and jalapeño – you can’t go wrong! Yum! Oh my goodness sakes! This looks absolutely delicious!